(WASHINGTON POST) - For as far as the eye could see, thousands of white tents the size of Winnebagos covered a grassland valley, surrounding a tent as large as a football field. Inside, monks had been chanting along with the lectures of high Tibetan lamas for hours. Outside, some 300,000 Tibetan pilgrims – many of them nomads – followed the prayers via stadium-size jumbotrons broadcasting the action inside. On my first afternoon in the valley, just outside Labrang Monastery, on the eastern edge of the Tibetan Plateau, I wandered through the sea of tents for an hour or so before pitching my own, which was designed for backpacking. My neighbours laughed at its size, then at me and invited me to dinner. I’d just finished my first year teaching Chinese history in Beijing, at an exchange programme for American high school students, and I was happy to be on my own for the summer. A decade earlier, in 2006, I’d been a student at the very same programme, and we’d visited the area in the last weeks of school. At the time, I remembered the Tibetan Plateau feeling different from the eastern cities of China, and not just because the air was cleaner. After living in Beijing for nine months, I couldn’t believe how much open space there was, and how slow the pace felt. During the trip, I’d also run across a backpacker travelling alone, who I envisioned wandering enchanted Buddhist grasslands without a care in the world. For a 17-year-old, it was hard to imagine more freedom. Ten years later, my reasons for visiting had changed somewhat. In the years I’d been away, ethnic riots had broken out in Lhasa in 2008, and a wave of self-immolations had begun in protest of Chinese rule. The Chinese government had responded by pouring money into the region in an attempt to buy back Tibetan loyalty, and the plateau was changing fast. But that also meant the area was becoming more accessible, and more tourists were visiting beyond intrepid backpackers. Over the past three years, I’ve returned multiple times to track the changes, but I never stop taking in the scenery. One of the best places to do that for first-time visitors to Tibetan areas is in Amdo, one of Tibet’s three main kingdoms. Today, Amdo includes parts of the Chinese provinces of Qinghai, Gansu and slivers of Sichuan, similar to the way New England comprises a region of six states in America. The Chinese government doesn’t regulate travel in the Amdo regions of Tibet as tightly as it does Tibet proper, and foreign travellers need not arrange travel permits to visit the region. Its rolling grasslands and hidden mountain ranges, however, are as breathtaking as any on the Tibetan Plateau, and its culture is as deeply entrenched. Amdo has produced a nearly endless number of influential Tibetan leaders, among them the current Dalai Lama, whose native prairies in Qinghai offer some of the most dramatic landscapes on the plateau. At elevations above 3,000m, Amdo’s winds and piercing sky can feel far removed from the smog of major Chinese cities, but its eastern edge lies only a few hours by plane from Beijing. To get there, most visitors fly into Lanzhou, the sprawling capital of Gansu Province, and then arrange a car or take a bus to Labrang Monastery, in Xiahe County, about three hours from the capital. Over the span of a 1,200m elevation gain from Lanzhou, the highway to Labrang provides a slide show of rapid cultural transition: urban sprawl gives way to the spires of Hui Muslim mosques in Linxia, and then, as the dry, cracked soil of the Loess Plateau transforms into a canvas of open grassland, Buddhist monasteries begin to emerge, marking the eastern edge of the Tibetan Plateau. The plateau offers two main activities for travellers: exploring the many monasteries scattered over the plains and trekking. Xiahe, Langmusi and Zhagana – a small city, a town, and mountain village respectively, all within a few hours’ drive of one another – offer both in spades to first-timers, though at different scales. Labrang Monastery, in Xiahe, remains one of the largest Buddhist institutions on the plateau, with some 4,000 monks. 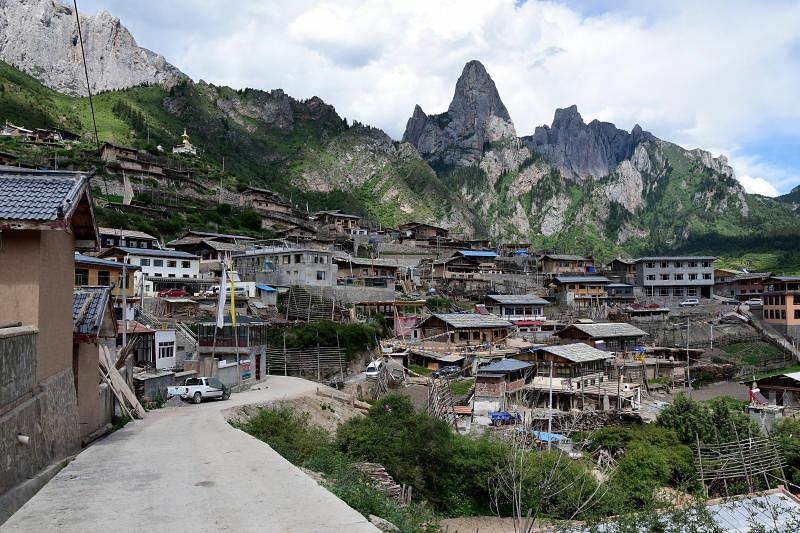 Langmusi, a high-elevation town that splits the Gansu and Sichuan border, draws smaller crowds of backpackers in the summer for grassland treks and glimpses of its two smaller monasteries. And only a two-hour drive from Langmusi lies Zhagana, a narrow valley of dramatic mountain villages ideal for high-alpine hiking. In the summers, I usually make my way between the towns by bus, and occasionally hitchhike, but travellers who don’t speak Chinese or Tibetan can find transportation just as easily with the guidance of a wide range of tourist agencies and guest houses that cater to foreigners. Asking whether the operation is Chinese-run or Tibetan-run is often a good idea; the region has had a troubled history with the Chinese government since Mao Zedong adopted the language of Marxist liberation in the 1950s to justify the Chinese army’s occupation of Tibet. The Tibetan historical narrative, to put it mildly, is more frank. 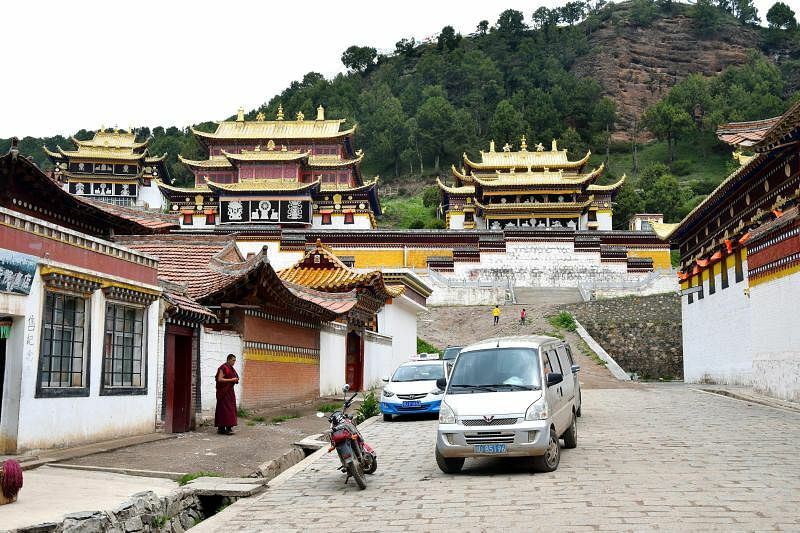 Labrang Monastery, which was rebuilt after most of it was destroyed in the Cultural Revolution, marks the first logical stop from Lanzhou, and most of it can be seen in a day. In the morning, it’s worth waking up early to walk around the monastery with the pilgrims, some of whom travel great distances to Labrang, while others stop there as part of their commute, prostrating themselves in a circumambulation of the complex. The beginning of late-morning prayers, marked by Tibetan horns and streams of monks hurrying to the central prayer hall, is sometimes open to the public. Afterwards, a stroll down the town’s main street offers a view of long sets of souvenir shops, especially those that sell Tibetan textiles, as well as the sprawl of the city. Amdo’s commercialisation on the walk is tangible as well, offering a reminder of how fast things are now changing. When I visit, I sometimes stay with a former farmer who, after opening his guest house a few years ago, now earns more than 1 million yuan (S$207,000) during the tourist season in the summer. The next stop, to Langmusi, is further removed from such aggressive commercialisation, though the town is expanding as well. From Labrang, the drive takes about four to five hours, but the grassland scenery is spectacular, and there’s an opportunity to break up the drive by stopping in Hezuo, the capital of Gannan Tibetan Autonomous Prefecture. There, a nine-storey temple – a rarity in Tibetan architecture – called Milarepa Lhakhang offers a great view. A climb up to the top through creaky floors passes through rooms filled with Tanka paintings of Buddhas and Arhats. The smell of yak-butter offerings near the shrines previews the many monasteries to come. The view from the top floor frames a typical expanse in modern Tibetan cities: an old monastery complex, then Chinese apartment sprawl and, finally, grasslands in the distance that extend into oblivion. Another two hours of driving and you’ll arrive in Langmusi, a small town representative of many in Amdo – construction of a new commercial strip, financed by the Chinese government, has recently doubled its length, which is only about 800m long. The town’s appeal lies in the two monasteries and the surrounding mountains, which make the place an offbeat haven for backpackers. Occasionally, a nomad will even shepherd herds through the middle of town. Dramatic cliffs rise up above one side of town into a cluster of jagged rock, and hillsides of fir trees tuck themselves into the gorges. Langmusi’s older monastery, Kirti, sits just below these mountains at the mouth of a gorge. About 90m up the ravine, groundwater trickles out of a rock bed and into a stream powering Tibetan prayer mills. A short hike above the gorge leads to tangle of prayer flags and a good spot to watch upland buzzards circling on thermals, searching for rodents. From the peak, Langmusi’s other monastery, Sertri, is easily visible, perched atop a hill on the other side of town, its golden roofs shimmering in the sunlight. Local divides in politics are visible as well; over the past few decades, Sertri, whose temples are in better shape, has done more business with the Chinese government, while more conservative Kirti has largely maintained its distance. In town – a bustling street of souvenir shops, guest houses and restaurants – both monasteries allow tourists to walk their grounds with an entrance ticket, and, for lunch, you can sample a yak burger at Leisha’s Restaurant. Walk up and down the main street and you’ll also see many advertisements for trekking – by foot or on horseback – across the grasslands surrounding Langmusi, often with the option to stay the night with nomads. The treks are well worth the time, especially ones that visit nearby Gahai Lake, a high grassland lake surrounded by distant mountains and home to many highland bird species. I first visited the lake after meeting, in a noodle joint, a few monks from Sertri who invited me to picnic by the lake. It was one of the most beautiful views I’ve ever had with lunch and also a reminder that, in small towns like Langmusi, it’s never a bad idea to strike up a conversation. But by far the greatest base for trekking in Gannan is the tiny mountain village of Zhagana, two hours’ drive from Langmusi across a winding valley. Cliffs, high peaks, streams, fir trees and terraced fields dominate the landscape – bringing to mind a kind of Tibetan Rivendell. In the 1930s, Mao’s Red Army used the landscape as cover, rampaging through the village on the Long March while fleeing Chiang Kai-shek’s nationalists. A number of local guest houses run treks up over high mountain passes and into grasslands hidden behind Zhagana’s imposing peaks, at over 3,650m, and some hikers trek up the very ravine Mao’s army descended during the Long March. The first time I visited, I arrived hoping to hike to nomad camps, but the weather took a turn for the worse. Still, my days in the mountain village were well spent: As I waited for the weather to turn, I read on a guest house porch, overlooking the rows of houses that clung to the mountainside, and hiked to the monastery in the afternoons. Then I went back to the porch and read some more, gazing over the mountains and sipping yak-butter tea. At times, construction rang out over the valley, reminding me of how fast Amdo was changing. But the view, at least, wasn’t going away anytime soon. This hotel is located a short walk along the river next to the monastery, and isn’t far from the centre of town. The central open space in the hotel is decorated in beautiful Tibetan colours, and there’s even a nice bar, along with an open atrium. You can’t beat it for convenience, and the staff speak English and can help arrange tours. Rooms start at US$45 a night. Zhagana’s main street has no name, but a walk up it reveals a number of guest houses, many of which cater to foreigners. This cosy guest house has both small dorm rooms and private rooms, and the cafe area is particularly comfy. Xiong, the founder from Chengdu, is friendly and speaks good English. There’s bright light outside, casting the guest house’s name on the sidewalk on the main street – you can’t miss it. Prices range from US$8 for a bunk to US$53 for a private room, although prices fluctuate depending on peak tourist seasons. Zhagana is full of guest houses, but there is not much English anywhere. Have a guide arrange a place for you. The best great guest house is Zhagana Shilin Yule, which also runs hiking tours in the area. Private rooms start at US$42. The views are stunning in all directions. A stop in Langmusi isn’t complete without paying a visit to Leisha’s Restaurant on the main street. The small backpacking haven features a yak burger, fresh yogurt and various teas. Main dishes will cost only a few dollars. For those who don’t speak Mandarin or Tibetan, a guide goes a long way in the Amdo regions. There are many great tour operations. To get started, try Tibetan-operated Snow Lion Tours, which offers customised tours and packages. Tour costs vary based on the time of year, itinerary, duration and number of people, and are set on a case-by-case basis. Located directly across from the Black Tent Cafe – another backpackers’ haunt in town – this company runs great trips all over the region, and arranges overnight homestays with nomads around the Langmusi grasslands. Two-day horse trekking tours for one person start at US$144. Hiking trips can be arranged via the team at Zhagana Shilin Yule, whose guides are locals with family members in the high-elevation grasslands. Expect to see some of the most stunning scenery on the plateau. Cost is determined on an individual basis, based on trip length, duration and number of people. 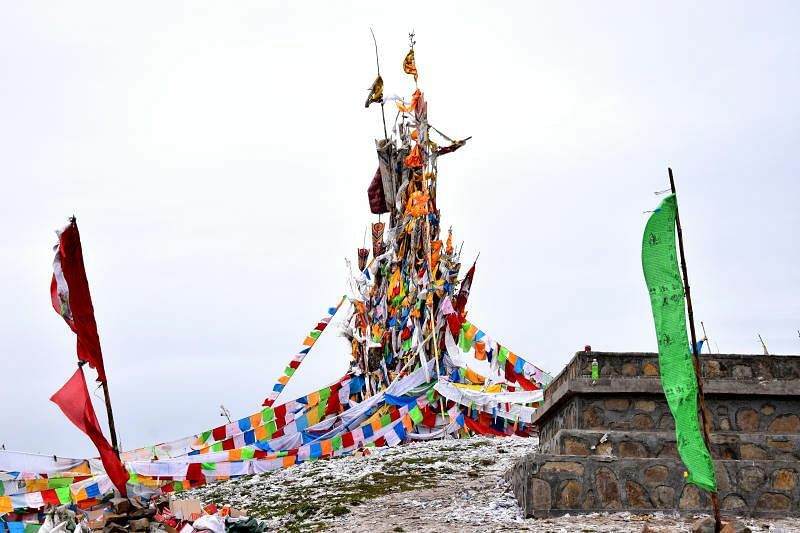 Perhaps the best resource and travel agency for booking Tibetan trips in any of the three main Tibetan kingdoms – Central Tibet, Amdo or Kham – is the Land of Snows. It has many different kinds of tours, and can help with almost anything. Costs are determined on a case-by-case basis.